StressNoMore was created to try to take some of the stress out of everyday life, by finding natural solutions to the everyday health products that bother us all at some point in our lives. 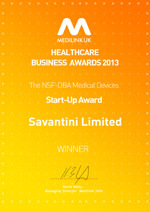 Savantini Limited, StressNoMore's parent company, was awarded the Medilink Business Healthcare Award for Best Start-Up for their work to help men and women with pelvic floor problems with the design, manufacture and retail of the Kegel8 pelvic toner range. StressNoMore understand the importance of a healthy life, and are always searching for new and exciting new products to make you look and feel amazing, both inside and out. For individual contact details please see our biographies. Stephanie is the founder of StressNoMore, and created the company from her passion for natural health and a healthy lifestyle. Beginning her career working for British Telecom before flying high working for Gulf Air in the Middle East, Stephanie then returned to the UK to start a family. Following the birth of her son Luke, she created Passion8, a women-friendly mail order company, and then her passion for healthy living led to the creation of StressNoMore where she first sold her award-winning Kegel8 range of pelvic toners. StressNoMore has grown from strength-to-strength, with several exclusive product lines and an ever-growing range. Ashley joined the team at StressNoMore after graduating from Liverpool John Moores University with a degree in Marketing BA (Hons). Ashley has a passion for sport and exercise as part of living a healthy lifestyle. This passion helps Ashley to source and promote exciting new products that will ensure our customers live happier and healthier lives. Ashley enjoys creating informative and useful content that gives customers guidance and advice on how our products can help with their health issues. Ashley is the creative mind behind the informative StressNoMore newsletters and social media pages and plays a huge part in making the StressNoMore website look as great as it does.